A new cap in Melbourne to replace a very knackered one and to mark the first stage of our Autralian ride. The cycle shop is just around the corner from where we’re staying and let us retrieve, from their cardboard recycling skip, two old bike packing boxes to tidy away our rides for the flight to Perth. How very kind of them! Great shop too. Washing my cycling cap after a week of pedalling from South Tottenham to Victoria I was reminded of the long weekend spent in Abingdon outside Oxford to celebrate Fiona’s 50th birthday. I’d cycled there from London choosing a route that took me along the Grand Union Canal before heading across the Vale of Oxford, tracing and re-crossing lanes we’d previously bicycled. Its a strange sensation when making a journey to realise you’re transversing the memory and place of another. It can happen along any byway, with a pattern of road junctions or a visual reminder of a mighty oak tree, that clicks the memory of other travels like a familiar echo. The canal’s towpath avoided the arterial roads of London by ducking behind flyovers and greened embankments as it snaked the contours of the land. Pedalling proceeded steadily, uninterrupted by walkers, fishermen, and other cyclists, as I moved ever westward. The sunlight sparkled off the canal’s waterway, bouncing light onto the underside of passing bridges with only the waterfowl’s splashes breaking the progressive quietness as I moved ever further from the capital. It was a good route to follow. I arrived that afternoon at the campsite, close to the house that had been rented for Fiona’s party, where Yasmin and I were to meet. After her arrival the next day we discovered the Hinksey Outdoor Swimming Pool and then the UBYK bike shop on Abingdon Road. The visit to the pool was a welcome relief after our respective rides to swim, stretch and relax before meeting everyone that evening. The bike shop, on the way back from the pool, offered much aesthetic distraction and the immediate purchase of the aubergine burgundy Le Coq Sportive cycling cap from a colourful display of many others. The shop’s black minimalist walls displayed bicycle frames as works of art, spot lit and hung against contrasting dark interiors, as if in an art gallery. The cap is now well worn and battered. The white lettering and Le Coq motif are slowly pealing away with the white stripe up top becoming an off white dull grey. Happily the cap still fits my head perfectly despite the miles and its many launderings. As I start to tidy up and clear out the accumulation of rubbish that must go before we head off cycle touring in July, I come across favourite bits of kit that I’m loathed to discard or leave behind. This cap I bought in Los Angeles from an independent cycle store called Orange 20 Bikes on Melrose Avenue, north of where my sister lives in West Adams. I like the cap because the bright blue colour and contrasting orange branding reminded me of the intense sunlight of southern California and my cycle rides around the urban sprawl of the city. 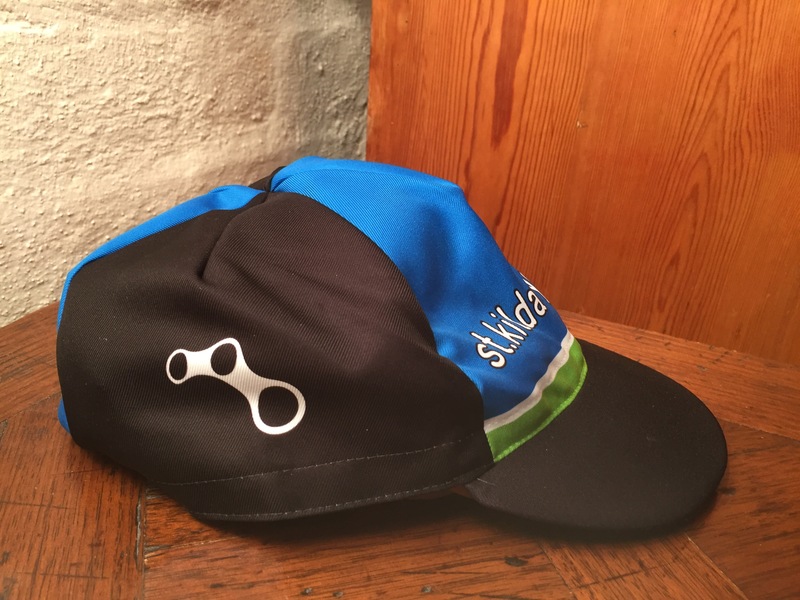 The hat is weathered and worn from these travels on my head as I pedalled along Ballona Creek, Venice Beach and to Santa Monica where I’d swim in the green foaming waves of the Pacific Ocean.